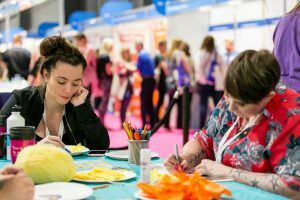 Twinkl returned to Childcare Expo Midlands for the second year in a row in 2017 with more fabulous workshops. See what the visitors were treated to below. Get ready to act out some swashbuckling role-play scenarios. Role-play masks are fun and are perfect for encouraging your children to really ‘take on’ their roles. We’ll be providing materials for various superhero role-play masks, so you’ll get the chance to make one and will be able to to take it away. All equipment and full instructions will be provided. 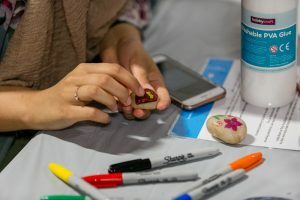 Story stones have many benefits: increasing imagination and vocabulary, helping develop communication and listening skills and getting sensory pleasure from touching the stones. 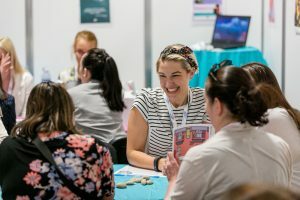 We’ll be demonstrating how you can make and use story stones in any learning environment just by using image cut outs, glue, felt tips and your imagination. Full equipment and instructions will be provided. Who doesn’t want to dress up like a superhero? 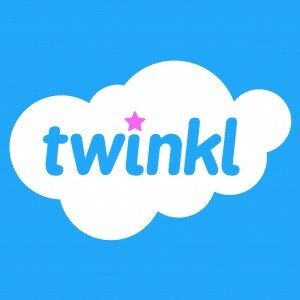 Come along to the Twinkl inspiration Zone as we delve into Fantasy and Adventure. Make your favourite superheroes shield and it’s yours to takeaway. 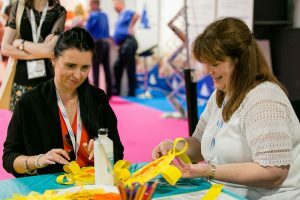 Escape the hustle and bustle of the arena and try your hand at creating puppets you can use in your classroom or nursery. These simple, yet effective, teaching tools will help the personal, social and emotional development of any child.